With the midterm elections around the corner, lawmakers Wednesday warned in stark terms of the dire need to harden the U.S. election system against attacks from foreign adversaries, saying that, even after Russia’s brazen attempt to influence the 2016 presidential election, the country is still woefully unprepared. “If we start to fix this system tomorrow, we still might not be in time,” chair of the Senate Intelligence Committee, Richard Burr of North Carolina, said about the midterm elections, which could affect the balance of power in Washington. 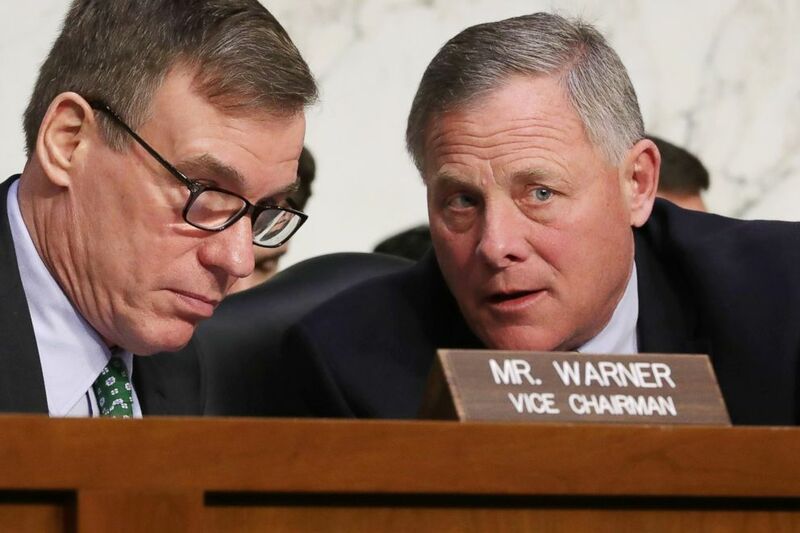 Senate Intelligence Committee ranking member Sen. Mark Warner (L) and Chairman Richard Burr confer during a committee hearing on Capitol Hill on March 21, 2018 in Washington. Nielsen noted that vulnerabilities exist throughout the entire election system — from the registration of voters through the validations of votes and the certification of voting when all is said and done. The secretary said she would consider the suggestion. Republican Sen. Susan Collins of Maine said the warnings, particularly in August 2016, were too technical in nature and did not reach the right people. A visibly frustrated Sen. Dianne Feinstein, D-Calif., said the Obama administration failed to sufficiently warn the public that the American voting system was being targeted. She said she and a small handful of congressional leaders had been warned of the specifics in a classified setting but were sworn to secrecy. Johnson said their warnings were overshadowed by other campaign news, saying they sounded the alarm just before the infamous “Access Hollywood” tape was made public. “I don't believe that it got the attention that it deserved. Because the public and the press were focused on other things about the campaign at the time,” Johnson said. For her part, Nielsen said even now states are reluctant to publicize potential attacks for fear of undermining public trust. But Feinstein was not having it. “I’m through with this,” the senator said, indicating she was prepared to out states that do not make attacks known to the American public. The committee has recommended that state election officials receive security clearances that will enable them to be briefed by federal officials on sensitive information. Several senators also pushed for all states to have a backup paper ballot system, so an auditable trail is left in the event of a system failure or breach. A recent report by the Center for American Progress, a liberal group, found 14 states use paperless electronic voting machines in at least some jurisdictions with five states relying exclusively on these machines which produce no paper trail. As Congress grapples with what to do next, members made clear they want the administration to release a cyber-retaliation doctrine focusing on offensive measures and deterrence, with a number of members decrying the fact that the administration did not already have one in place. Nielsen said she would go to her colleagues and to the president and “sit down” to discuss the matter. The committee, Burr said, expects to release a full election security report to the public by week’s end, closing the book on one of four parts of its investigation into Russian meddling in the 2016 election and possible collusion between the Kremlin and the Trump campaign.